Bedrock (comprised of the Columbia River Basalt Group) lies an estimated 1.5 to 6 m beneath the site. The top-most basalt flow is the Elephant Mountain Member of the Saddle Mountains Basalt Formation, with an estimated age of about 10.5 million years. Structural uplift of the Horse Heaven Hills anticline slowly tilted the basalt surface (~2.5°) to the north (Guettinger, Last, and Barton, 2010). A northwest-­‐southeast trending thrust fault produced a topographic high in the southern portion of the site. Over the next several million years, the basalt surface was exposed to soil development and erosional processes, giving rise to a thick calcic paleosol and localized alluvial fan deposits, including a basaltic conglomerate composed of poorly sorted angular basalt clasts (i.e. fanglomerate). 230Th/U age dating suggests that the closest minimum age for deposition of the fanglomerate may be 268±7 ka (thousand years ago) (Paces, 2014). 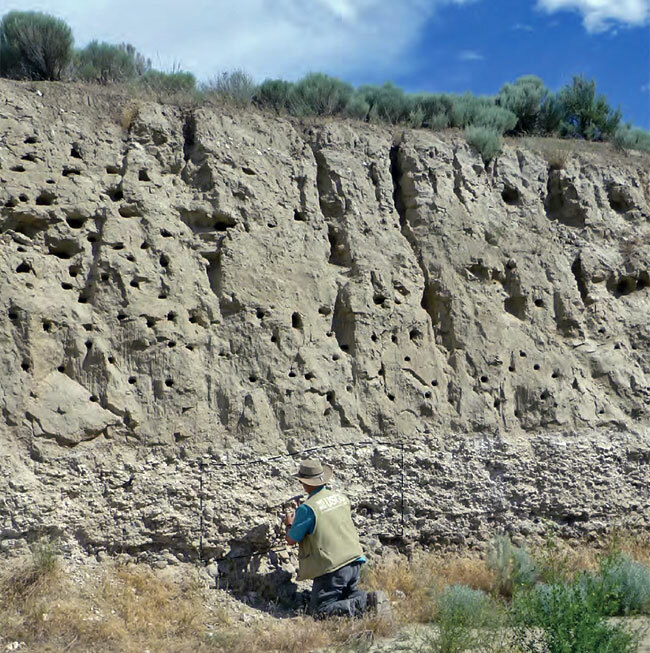 Fine-­grained (slackwater facies) Ice Age flood deposits and loess blanket the surface, along with localized deposits of colluvial slopewash.